Jesus Luzardo won't be on the opening day roster, but Scott White identifies some other spring standouts to target at starting pitcher, including Matt Strahm, Brandon Woodruff, Pablo Lopez and Wade Miley. Wednesday Spring Notes: Are Bird, Cessa worth it? Well, isn't that a punch in the cuff? All those weeks spent watching, wondering, reveling and hoping Jesus Luzardo would get a legitimate chance to crack the Athletics' starting five this April is now completely out the window. The 21-year-old will be shut down 4-6 weeks with a strained rotator cuff. On the one hand, we always knew there was a chance he wouldn't make the cut. After throwing 109 1/3 innings in the minors last year, he only has so many to work with, and the Athletics may have wanted to save more bullets for later. And now they're forced to, which should make for a clearer path once Luzardo is ready to go. On the other hand, bummer, dude. By the sound of it, he won't even start throwing for 4-6 weeks, which puts him coming back in ... June? At the earliest? It doesn't mean he's undraftable. He's still an exciting pitcher with a ridiculous changeup and a ton of upside, and we are, after all, drafting Forrest Whitley, who probably won't reach the majors until midsummer either (if even then). But Luzardo is more like a late-round flier now, especially since you probably won't have the luxury of stashing him in an IL spot. Fear not, though. There's never a shortage of starting pitcher sleepers, and several of them put their best foot forward Wednesday. Let's begin with the SPARPs, not only because they're of particular interest in Head-to-Head points leagues (being eligible at relief pitcher and all) but also because they have the most upside of the group. Matt Strahm continued to show how effective his four-pitch mix is as a starter, striking out four over five two-hit innings. He had a 2.01 ERA, 0.98 WHIP and 10.1 strikeouts per nine innings as a reliever last year. Brandon Woodruff, meanwhile, struck out eight over 5 2/3 innings after striking out seven over five last time. He did allow three earned runs Wednesday, two on a Manny Machado home run, but they're the first he has allowed all spring. Those two are must-drafts, in my estimation. Then there's Wade Miley, who deserves a long look in the late rounds just because the Astros planted their flag in him. They've dug up so many pitching gems through their careful implementation of data that seeing him deliver another strong outing in which he allowed one run on three hits with five strikeouts in 4 2/3 innings only bolsters my confidence. Pablo Lopez dominated again, following up four no-hit innings two outings ago with six two-hit innings this time. He struck out five and walked none. Crazy part is he might only be the Marlins third-most impressive pitcher this spring, behind Trevor Richards and Caleb Smith, which is why he's still fighting for a rotation spot. Then there's Michael Pineda. Remember him? He two-hit the Pirates over five shutout innings Wednesday, delivering his most impressive outing so far in his return from Tommy John surgery. I haven't totally come around to the idea of drafting him yet, at least not in a standard mixed leagues, but he's definitely someone I'll be looking to pick up if his first couple regular-season starts go well. Walker Buehler didn't make his first spring start until Tuesday, and lest you think you he was building up on the backfields, the Dodgers have already made it clear he won't be ready to handle a full workload at the start of the season. "When he does make his start there are certain expectations," manager Dave Roberts told MLB.com. "At that point in time, we can have people that can piggyback him and finish a game." Actions have consequences, and the consequences of Buehler's month off are a couple starts at the beginning of the year in which he may not even go the minimum five innings needed to secure a win, which I think makes him less than an automatic play, particularly in points leagues. Of course, the other side of the coin is that Julio Urias, who we already know won't have a rotation spot at the beginning of the year, is the most logical choice to piggyback Buehler, possibly vulturing a win in a multi-inning appearance. Is it reason enough to start him? Well, maybe in deeper leagues. Though Buehler was technically sidelined by arm discomfort, you have to think this is all by design. These are two young pitchers who the Dodgers recognize need their innings preserved. Piggybacking them is one way to do it, particularly at a point in the season when the stakes are at their lowest. Of course, it's not an encouraging development for a pitcher being drafted like an ace, like Buehler is. Hunter Pence didn't exactly fill up the box score Wednesday against the Reds, but when a day in which he reaches base at a .667 clip is considered disappointing, you know he's doing some remarkable things. In most cases, those numbers would be lost to the anonymity of spring training, especially since he's a 35-year-old who last year couldn't stick in a Giants outfield currently highlighted by Steven Duggar. But Pence spent his offseason working with Doug Latta, the hitting guru who helped make Justin Turner everything he is today. The results have been so loud that he may have forced his way into the Rangers outfield, pushing aside younger options like Willie Calhoun and Delino DeShields. What might be most impressive, though, is that he's 6 for 6 on stolen bases. He has been a 20-steal guy in the past, and if he's succeeding at that rate, what's stopping him from doing it again? The whole thing is a long shot, but there's a path here to Fantasy relevance. The youthful energy he's showing this spring puts him on the radar and the work he did to retool his swing allows us to take him seriously. Sean Newcomb had another outing where he simply couldn't find the strike zone Wednesday, walking five in his five innings at the Blue Jays. That's 13 walks now in 15 innings this spring, and at this point, it's fair to wonder if he deserves a free pass given all the success had by Touki Toussaint, Kyle Wright, Max Fried and even Bryse Wilson this spring. It'd be one thing if he was a rotation force last year, but the numbers were iffy and worse if you isolate just the final three months, when he put together a 5.45 ERA and 1.52 WHIP across 15 appearances, 14 of them starts. If nothing else, it suggests another opportunity for both Toussaint and Wright to stick around once Mike Foltynewicz is back from a sore elbow. Newcomb has major control issues and hasn't proven to be a good enough bat-misser to make up for it. Tyler Glasnow, meanwhile, has proven to be an excellent bat-misser, but his control issues this spring are beginning to raise concerns as well. He walked four in 3 2/3 innings Tuesday, giving him seven walks in 7 1/3 innings over his past three starts. The lack of innings is itself a concern. He made a big deal about adding a pause to his delivery at the start of spring training, and while it made me uneasy at the time, I'm straight up worried now. Dude, you finally figured out how to throw strikes in those 11 starts after being traded form the Pirates to the Rays late last year, and now you want to tinker with your delivery? That's just asking for trouble. It's not enough for me to remove Glasnow from my breakouts list, but I'm less inclined to go out of my way for him on Draft Day. You know who else is on my breakouts list? Nick Pivetta, who just struck out eight over five innings in his latest spring start Wednesday against the Tigers. Apparently, he's on manager Gabe Kapler's breakout list, too. 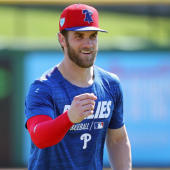 "We sat there and watched the game today and one of the things we kept saying was, 'That's A-plus, elite stuff,'" Kapler told The Philadelphia Inquirer. "We've known that for quite some time, but he is starting to harness it a little bit. We saw it last year in flashes and actually in some longer stretches as well. It's definitely in there. He has the potential to be a breakout performer, for sure." If you need a reminder what makes Pivetta such an attractive breakout candidate, you'll find it here.